We’ve put hours into our garden, mostly because we enjoy it. There’s nothing like the satisfaction of picking food off a plant that you planted and nurtured. Nothing tastes as good either. The first few tomatoes are starting to ripen, but it remains to be seen if we’ll get a good crop. 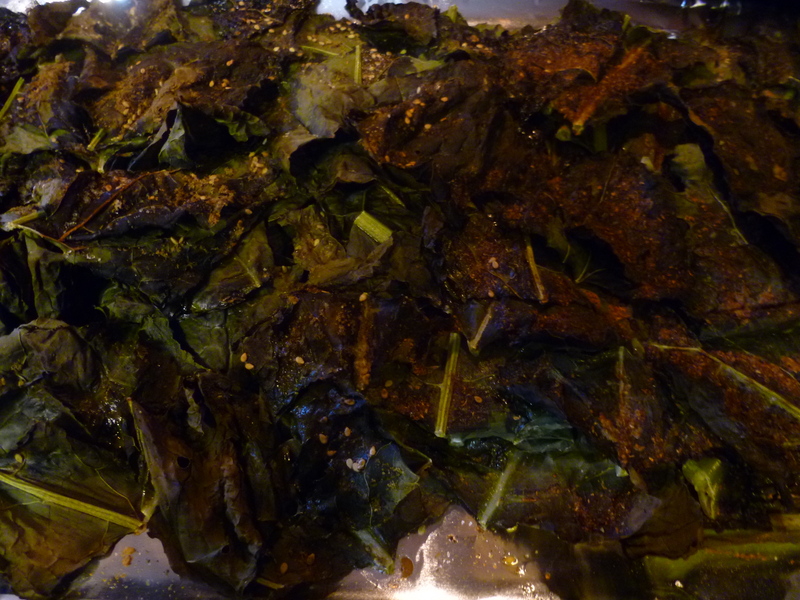 If all else fails, though, we’ve got kale–so much kale that we’re eating it almost every night. You might think we would tire of kale. But it’s tasty and really good for you. We toss it in salads, roast it and even bar-b-que it. Granola Baby and I once ate a whole head of it for dinner by ourselves. 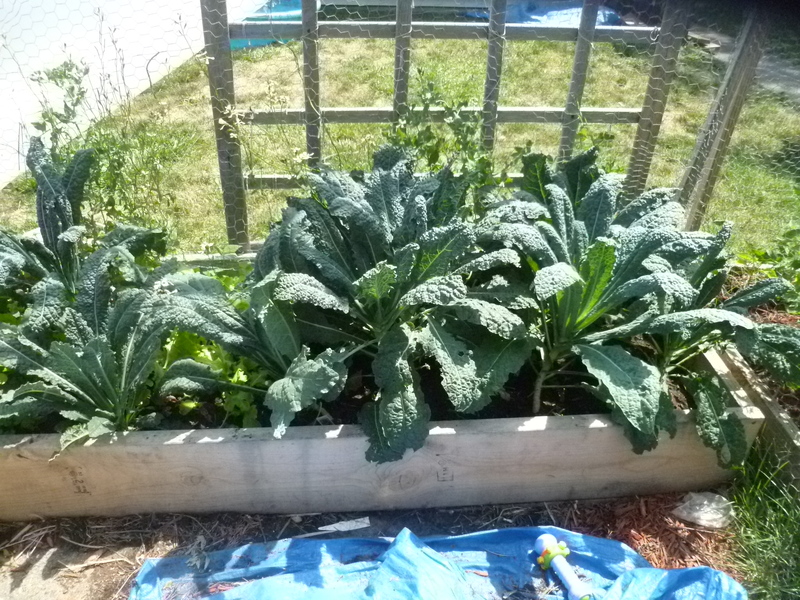 And for my dear friends who are afraid of checking yummy, healthy greens for bugs–this dinosaur kale is super easy to check. Below is our favorite (and easiest) kale recipe. Don’t be above bribery if your kids (or husband) won’t try it. In our house, everyone who tries a new food or retries one they don’t like gets a treat. Works like a charm on kids and adults alike. Place kale on a baking sheet. 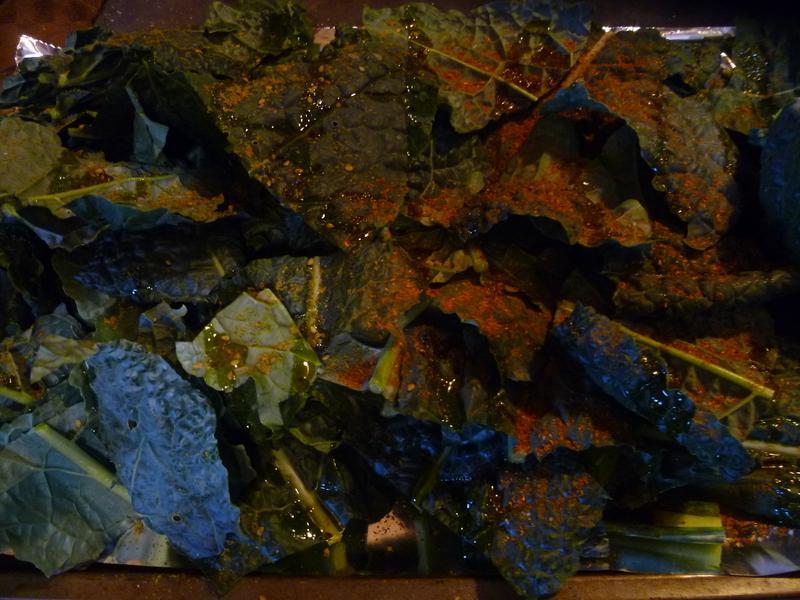 Combine spices and sprinkle evenly over kale. Drizzle with olive oil. Roast at 375 for 10 minutes or until desired crispiness. For the grill, leave it over a low flame for 1-2 minutes per side. We love kale! Its one of my kids’ favorite veggies! Usually I just put garlic and salt on it but can’t wait to try this recipe! 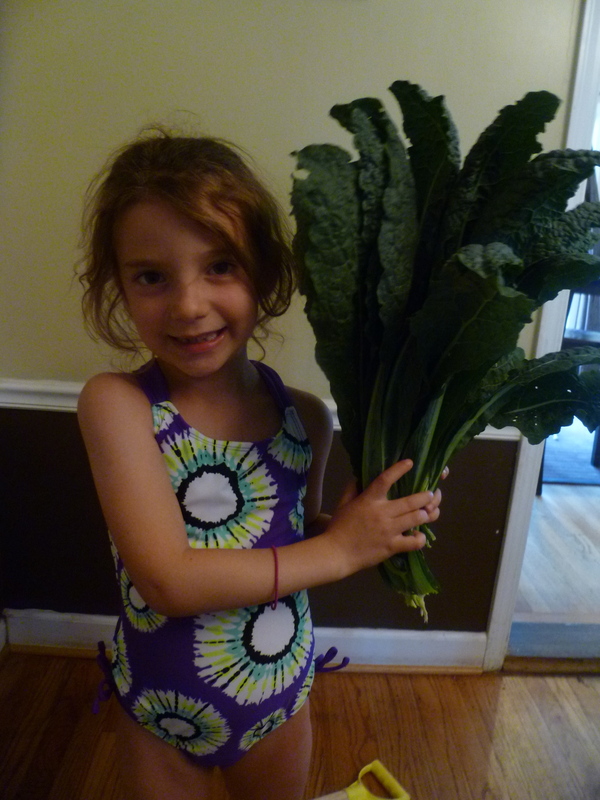 Glad to know we’re not the only family with kids crazy enough to munch on kale! How funny! I just got a kale recipe from Joy of Kosher the same day as this. Take Kale leaves off of stems and discard the stems. Tear the leaves into bite sized pieces. Mix all the dressing ingredients in a contianer and shake it to mix. About 20 minutes before serving, pour the dressing over the kale and with your hands mix the dressing with the kale while massaging the kale, you will see the kale turn a brighter green and shrink in the bowl as if you cooked it. Top with walnuts and dried cranberries and enjoy. It is also very good the next day. very funny! i guess b/c it’s in season. I love miso on almost everything. minus the cranberries–eek! Not sure if I asked you this already, but are you the Sara I worked with at Jewel in 2002? barb hooked me up to your blog! so funny! i couldn’t remember if that was your last name. Hope all is well! BH things are good. Still at Jewel…busy with the family, trying to be healthy (not as healthy as you) and exercise. Your blog is great and I wish I had 1/2 the amount of energy and determination you have! Keep up the good work!…My favorite recipe of yours was the cookies with almond butter,chocolate chips and oatmeal (helped me use up the chametz before Pesach). I wish we could get some of the ingredients you post here in Israel easily and with a decent hechsher. Almond butter is plentiful but it is sooo expensive here; wraps are hard to find and pricey. Guess you can’t have it all!… Nice to “chat” with you after all these years!